Chromosome translocations resulting in fusion genes have been implicated in leukemo-genesis. The paradigm involves the fusion of the genes encoding BCR and ABL, leading to a constitutively active tyrosine kinase. The detection of BCR-ABL has been limited to fluorescence in situ hybridization analysis, reverse transcription-polymerase chain reaction, of mRNA, and Western blot of analysis downstream effectors in the BCR-ABL activated pathway. Here, we describe a novel immunoassay that directly measures levels of BCR-ABL fusion protein and its phosphorylation in peripheral blood plasma and cell lysates. This approach has the potential for widespread application in the detection and quantitation of other fusion genes involved in hematological malignancies. Key Words: CML; BCR-ABL; targeted therapy; quantitative flow cytometry; leukemia; imatinib mesylate. The molecular analysis of recurring chromosome rearrangements such as translocations and inversions has provided valuable insight into the pathogene-sis of hematologic malignancies. Many translocations result in the fusion of genes located at the translocation breakpoints. The paradigm is the t(9;22)(q34;q11) translocation resulting in the BCR-ABL fusion gene, which encodes a cytoplasmic protein with constitutive tyrosine kinase activity. BCR-ABL is present in patients with chronic myeloid leukemia (CML) and in a subset of patients with acute lymphoblastic leukemia. The BCR-ABL fusion protein has been successfully targeted for therapy by a tyrosine kinase inhibitor, imatinib mesylate (Gleevec®; Novartis Pharmaceuticals Corporation, East Hanover, NJ) (1-3). As resistance to this drug has been observed in patients with mutations affecting the ABL kinase domain (4), several new, more specific, kinase inhibitors are in development. Conventional approaches to the detection of BCR-ABL are limited. Fluorescence in situ hybridization analysis largely depends on the availability of intact and informative interphase nuclei. Reverse transcription-polymerase chain reaction is hindered by inherent variability in amplification and standardization of quantitation (1,5). Monitoring the activity of the BCR-ABL protein itself is also difficult. In clinical material, the unstable fusion protein is subject to rapid degradation and dephosphorylation. Western blot analysis of downstream effectors of BCR-ABL, such as AKT and CRKL, has been used to monitor BCR-ABL activity (6). However, these strategies are complicated by the presence of kinases other than BCR-ABL that may contribute to the activation of downstream effectors. 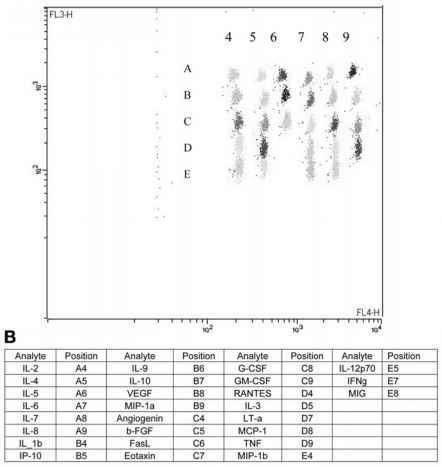 Diagnostic tests adaptable to clinical laboratories are needed for direct and quantitative measurement of total and phosphorylated BCR-ABL protein. We describe a simple and reliable immunoassay for measuring levels of BCR-ABL protein and its phosphorylation state in plasma. Monitoring the activity of BCR-ABL protein in CML patients would provide information on patient response and efficacy of therapy. This approach could be applied to other fusion genes in the monitoring of residual disease. 1. 6.9-pM Carboxylated polystyrene beads (Bangs Laboratories, Fishers, IN). 2. Carbodimide (Sigma Aldrich, St. Louis, MO). 3. Sodium dodecyl salt (10% [w/v]) (Bio-Rad Laboratories, Hercules, CA). 4. BCR antibody (Santa Cruz Biotechnology, Santa Cruz, CA). 5. c-ABL antibody (Santa Cruz Biotechnology). 6. Phospho-ABL (Thr) and Phospho-ABL (Tyr) rabbit monoclonal antibody (Cell Signaling Technology, Beverly, MA). 7. Phycoerythrin (PE)-labeled goat anti-rabbit IgG (Santa Cruz Biotechnology). 8. PE-labeled rabbit anti-mouse IgG (Jackson ImmunoResearch, West Grove, PA). 9. Seven-color setup beads (BD Bioscience, San Jose, CA). 10. QuantiBRITE™ PE beads (BD Bioscience). 11. Sorvall cell-washer 2 (Thermo Electron Corporation, Asheville, NC). 1. Flow phosphate-buffered saline (PBS): 5.6 g sodium phosphate dibasic, 35.48 g sodium chloride, 2.8 g bovine serum albumin (BSA), and 4.0 g sodium azide. Add deionized water to 4 L; adjust pH to 7.4. 2. Blocking buffer (1X PBS + 5% BSA): 10X PBS (Ca+/Mg + free) and 0.5 g BSA. Add deionized water to 1 L; adjust pH to 7.4. 3. Activation buffer (0.05 M sodium bicarbonate): 4.2 g sodium bicarbonate. Add deionized water to 1 L; adjust pH to 8.0. 4. Quenching solution (40 mMglycine): 3.02 g glycine. Add deionized water to 1 L; adjust pH to 7.4. 3. FlowJO™ analysis software (Treestar, Ashland, OR). 4. QuantiBRITE PE beads (BD Bioscience). The number of total and phosphorylated BCR-ABL protein molecules bound per bead (ABC) is measured by quantitative flow cytometry. Polystyrene beads are used for immunoprecipitation of BCR-ABL protein from patient plasma. BCR-ABL protein is quantitated with antibodies that have PE conjugated at a 1:1 ratio. Fluorescence values obtained from beads are compared against a fluorescence standard established with QuantiBRITE PE beads, a set of four-bead populations each with a known number of bound PE molecules/bead. The use of 1:1 labeling allows the staining intensity on the bead surface to be converted to number of molecules bound per bead. 1. Calibration should be performed prior to every acquisition using seven-color setup beads (BD). Beads are prepackaged to be reconstituted with provided buffer. 2. The FACSCanto is prepared by running "Fluidics Startup" and selecting the appropriate acquisition template and instruments settings on FACSDiva software (BD Bioscience). 3. Standardization is performed before acquisition of samples using QuatiBRITE PE beads, which are reconstituted with 1 mL of flow PBS. Five thousand events are acquired on the FACSCanto. An example of the result is shown in Fig. 1. 1. All washes are performed with centrifugation at 17,949g for 2 min at room temperature unless otherwise stated. 2. Carboxylated polystyrene beads are coated with antibodies directed against BCR protein according to the manufacturer's protocol. 3. After washing and dilution (1:10) in activation buffer, the beads are activated with carbodimide (0.01 g/100 pL of original bead volume) for 20 min at room temperature with mixing.